The predicted floods are here from the previous winter storms. Large swaths of the midWest are being affected. 12 million people impacted and we are just at start. Be cautious. Do not attempt to drive or walk through standing waters. There are very fast currents. And those of you in South, get your sand bags and bug out bags ready. The midWestern cities have no choice but to let these waters flow unabated. Nebraska is grappling with the worst flooding the state has seen in half a century, according to the state's governor, as severe weather and heavy rain slammed the Midwest on Friday. On Friday, Nebraska Gov. Pete Ricketts called the flooding "historic," adding that he would be surveying the extent of the damage. "Nebraska has experienced historic flooding and extreme weather in nearly every region of the state,” Ricketts tweeted. The Nebraska Emergency Management Agency tweeted that emergencies had been declared in 53 counties, 41 cities and one tribal area as of Friday night. Missouri River looking bad. Dams already failing, shutting down nuclear plant. A guy on another forum was asking me why I was canning meat etc. I pointed out natural disasters as one reason and posted the link in this thread. He got it. This is not like other floods. The amount of water moving is very high vs. recent history. Even heavy machinery is no match. Be extra cautious. So just got off phone with a geophysics friend of mine. He says it is all hands on deck for the hydrologists. They think that the amount of water headed to the Mississippi could potentially change its course in some places. Dont hear that very often! I'd imagine I-57 and I-55 (MO.) will be having issues again this year. Bootheel area. The purple dots are the major flooding. All of that is headed South. No problem here on the coast, but upstream they're going to have a wild ride. I remember back in 2011, the CoE had the Mississippi so fine-tuned with various spillways that the river levies in New Orleans were within a foot of topping and that was considered ample margin for error. It was spooky to see in person though. I wonder how this year will compare. Already spillways being opened to protect New Orleans and barge traffic being stopped on the Red.River. It's been a commercial mainstay for centuries. The use of waterways to move products for public use. But now an annual conversation of high water has made an impact locally to the Port of Caddo-Bossier and it's early in the season for this to occur. That's because the mighty Mississippi River is on the rise. Flood warnings have been issued for Jefferson, Orleans, Plaquemines and St. Bernard parishes through March 23. The Bonnet Carre spillway has been opened to protect the city of New Orleans from flooding. All of that will have an impact on barge traffic leaving the Red River. The fast currents are giving even professionals problems. Sad, a fuel spill on the river. The U.S. Coast Guard reopened the waterway closure on the Mississippi River from mile marker 224.5 to mile marker 226 after a vessel sank near Baton Rouge, La., Thursday. General Anchorage remains closed. A Coast Guard Marine Safety Unit Baton Rouge incident management team confirmed an oil sheen in the water. There is a reported potential of 18,500 gals. of fuel aboard the 65’x24′ towboat Michelle Anne. An unknown amount of oil has discharged into the river. The four crewmembers escaped to the barge and were recovered by a nearby tug. There were no reported injuries. The barge was recovered as well. Bystander videos posted on social media and by television station WBRZ showed the Michelle Ann pinned against the anchor chain of the 738’x106′ bulk carrier Iolcos Unity, listing to port with one of its twin propellers out of the water and still turning. The cause of the incident is under investigation. Farther north on the Missouri River, the Coast Guard issued a waterway closure to all vessel traffic on the Missouri River from mile marker 450 near St. Joseph, Mo., to mile marker 550 approximately 50 miles south of Omaha, Neb., due to high water levels and dangerous currents, Friday. This is insane video showing how high river is. Ugh! Near ice cold too. Doesnt get much more dangerous than that. 10 to 15 minutes in that and you would be hard pressed to survive. These large scale floods are the most predictable of natural diasasters (thank you, hydrologists). If you are in the path of this water please take precautions and warn your neighbors. It has already caused multiple deaths. This is a serious event. Residents in Kansas and Missouri were steeling themselves Monday for the deadly and “unprecedented” flooding that's already saturated large portions of the Midwest, mangling hundreds of homes and raising the Missouri River above record water levels in many areas. In Atchison, Kansas, a city with a population of more than 10,000, businesses are reported to be piling up sandbags as the National Weather Service is forecasting river levels to reach 30 feet there later this week – something likely to prompt major flooding. Vice President Mike Pence will visit Nebraska Tuesday to survey the damage caused by historic flooding responsible for killing at least three people. The Midwest is bracing for more flooding as rivers in 40 locations have risen to historic levels. Flood watches and warnings are in effect in more than a dozen states and more rain is on the way. More than 70 cities in Nebraska have issued emergency declarations over what is the worst flooding the state has seen in at least 50 years. The total damage is already in the hundreds of millions of dollars and is expected to climb as the flood threat remains. The views from the sky over the flooded Midwest reveal miles and miles of devastation. CBS News' DeMarco Morgan took a plane to Fremont, a town of 26,000 that is nearly isolated by the water. Volunteers with planes are helping fly in supplies. "Fremont's landlocked and you know, they're running out of food … So I was just more than happy to help," one volunteer said. While on the ground, a convoy led by the Nebraska National Guard delivered aid along restricted routes. "I think it's good to see the community come together … bringing supplies in from Omaha and other towns," one mother said. "Everyone's helping out." Since Sunday, more than 4,400 people have been evacuated from their homes in at least four states and rising rivers have breached nearly 200 miles of levees. Received an action alert last night that CAC may be deploying to help the flood victims. ACTIVATION ALERT - This is to inform you that within the next few days, it is possible that we will be deploying some financial and human resources in response to the flooding in Iowa and Nebraska..."
Thanks for the updates. We just realized we have extended family in Lincoln. We'll be ck'n on them. Nebraska governor calls flooding "most widespread destruction we've ever seen in our state's history"
Nebraska Governor Pete Ricketts says farmers are bearing the brunt of "the most widespread destruction we have ever seen in our state's history." Ricketts spoke to CBSN on Wednesday about the dire set of circumstances Nebraska faces after the unprecedented flooding disaster. Rickets declared a state of emergency as more rain is expected to soak the already flooded region. States of emergency have also been declared in Iowa, Wisconsin and South Dakota. The floods have been nothing short of catastrophic: At least three people have died, and estimated farm loses could top $1 billion. Parts of 15 states are under flood watches and warnings. Ricketts said14 state bridges were damaged and 200 miles of highways can't be used until roads are repaired. "We're still very focused on keeping people safe right now and as late as yesterday we were still conducting rescues of people," he added. I've seen a lot of midwest flooding but I have never seen towns flooded up to near the rooflines before. So many bridges washed away too. A motel sits inundated with flood water at the intersection of Highway 34 and Interstate 29 on March 20, 2019, in Mills County, Iowa. If 34 is underwater, HWY 2 is most likely flooded there at the MO/IA line also. Missouri river is right there west of 2 and 29, where you croos the bridge into NE. 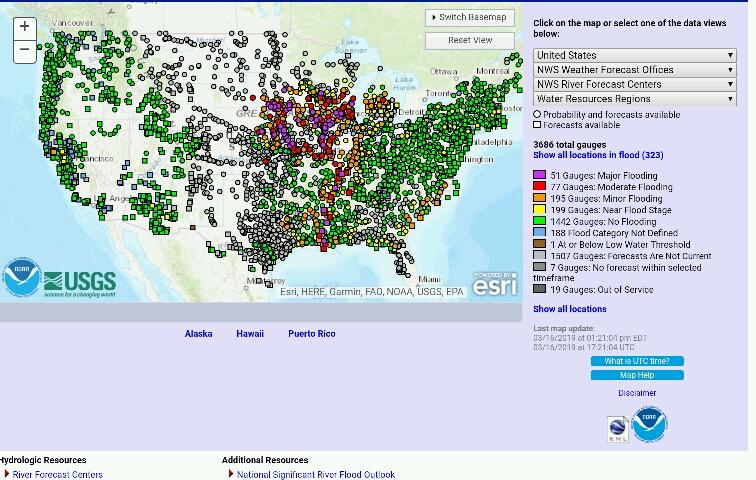 ...The areas of greatest risk for moderate to major flooding include the upper, middle, and lower Mississippi River basins including the mainstem Mississippi River, Red River of the North, the Great Lakes, eastern Missouri River, lower Ohio, lower Cumberland, and Tennessee River basins. Hmm.. Looks like upper Northeast is a potential danger zone too. Wow, even the Galveston Bay area minor to moderate flooding. Kansas City, MO drinking water compromised. Shows value of filters in preps. Record flooding along the Missouri River has impaired treatment of drinking supplies in Kansas City, raising health risks for infants, the elderly and other people with compromised immune systems, the municipal water service warned on Saturday. 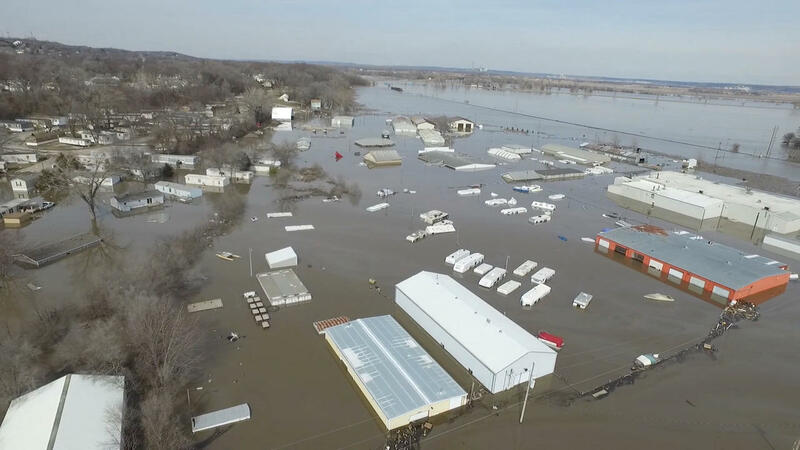 The public health advisory came as utility crews struggled to replace broken pumps at a wastewater treatment plant submerged by floodwaters about 30 miles upstream in Leavenworth, Kansas, a town of 35,000 on the river's west bank. Some of our kids are in KC. The MO side. We've bought and supplied them with drinking straws for their GHB's.